There was one thing more in Dr. Tamalet’s office that I had come to recognize as standard equipment in all French medical facilities: a green and gold sign that read: NOUS ACCEPTONS LA CARTE VITALE—“We accept the carte vitale.” In a way, that promise was the most predictable, and the most important, element of the French health care system. 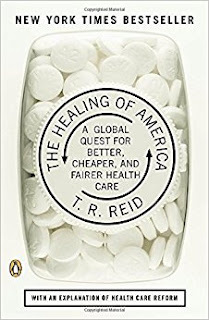 For me, the carte vitale—a green plastic credit card with a small gold memory chip in the middle, the central administrative tool of French medicine—became a symbol of what the French have achieved in designing a health care system to treat the nation’s 61 million residents. They’ve achieved a lot. Whether or not you agree with the World Health Organization’s conclusion that France has the world’s No. 1 heath care system, all the statistics on national health suggest that France rates near the top of the globanl rankings. France does a better job than almost any other country both in encouraging health and in treating those who get sick. As noted earlier, France has the best performance of any nation on a key measure, “Mortality Amenable to Health Care”—which is to say, the French medical system does the best job of curing people whose diseases are curable. The French rank near the top—and sharply higher than the United States—on standard health measures like Disability-Adjusted Life Expectancy (DALE), infant mortality, and life expectancy among adults. (An average sixty-year-old Frenchwoman can expect to live in good health for a further twenty years and three months; a sixty-year-old American female will average another seventeen years and eleven months of healthy life.) The French health insurance system covers every resident of France and guarantees everyone a roughly equal level of treatment. France has more doctors per capita than the United States and more hospital beds. The French go to the doctor about eight times per year, on average, compared to five visits for Americans; the average Frenchman takes more pills and shots than Americans do. Continuing the tradition of doctors Péan and Latarjet, the French are significant innovators in health care and pharmaceuticals. In short, the French are big consumers of medicine, and they get a high-quality product. Yet France pays less than we do for health care.